Two year olds are full of energy, curiosity, and are beginning to develop independence. 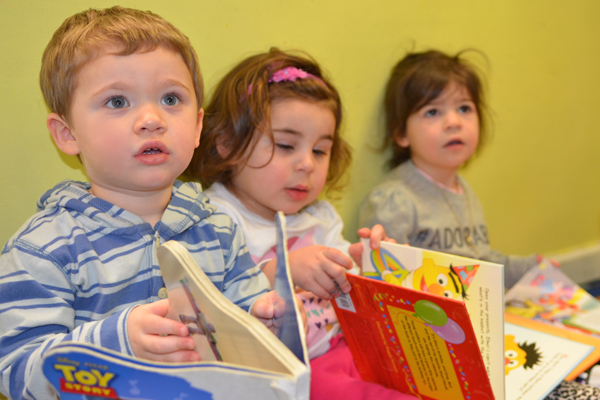 The program gives two year olds an opportunity to explore, share, and learn through play while under the guidance of a positive nurturing staff. 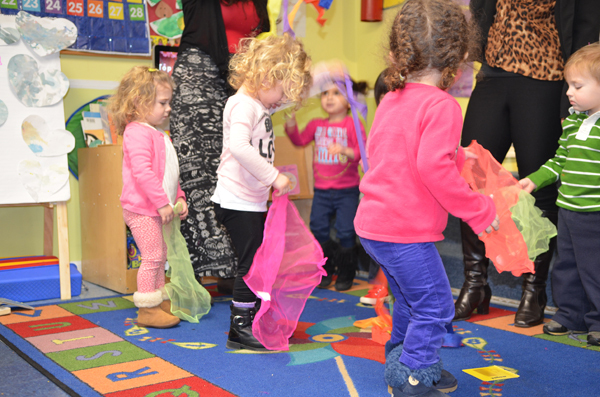 We place a strong emphasis on social interaction and work to expand each toddler’s language ability to express themselves creatively through music, art, dance, and physical education. The teachers provide an atmosphere where the children have a balance of freedom of activities and teacher directed activities. Physical development is emphasized through complex gross and fine motor skills taught inside the classroom and in the outdoor play yard. The children will participate in a variety of large-muscle activities. They will begin to demonstrate eye-hand coordination through these activities. Social development is fostered by building friendships in the classroom and beginning to understand and use expected behaviors in a group setting with cooperation. There is a focus on emotions and self-control while learning how to share with their peers. Cognitive development is focused on language, listening to stories, matching and sorting colors, alphabetic knowledge, counting, following simple directions, and beginning to experiment with writing instruments. Toilet use will occur during the two year old program when the child exhibits signs of interests. The teachers will motivate the children with positive reinforcement while encouraging the children to participate in potty training. 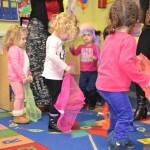 Children are greeted with a new song per week, and are introduced to the days of the week, the months of the year, the seasons of the year, and the weather through music and dance. A balance of individual and small groups in centers set up in the classroom. One teacher directed activity at this time will be set up for the children to participate in. The children will listen to a story read by the teacher. Teachers will assist children with washing their hands, cleaning up and preparing for lunch. Teachers will change diapers and assist children with using the toilet. Children who are half day will be dismissed outside in the front of the school. Children will be assisted by the teachers in cleaning up lunch boxes and washing hands. Children will use the toilet or teachers will change diapers, while cots are prepared for nap time. The children will be encouraged to begin to make their cots by putting on their sheets. The children will engage in nursery rhymes and/or poems in a small group through song, hand puppets, finger plays, or dance movements. The children will nap while listening to classical lullaby music. After the children wake up from nap they will enjoy a small snack and beverage with their friends. A balance of individual and small groups in centers set up in the classroom. One teacher directed activity at this time will be set up for the children to participate. Children will participate in a ten minute teacher directed large group activity and a quick recap of the day. The class will then prepare for departure.